Before Nell died, she knew she needed to record a story, a story she had found very hard to share, a story that stretches back before her time. After Nell dies, her daughter to whom she said little, and her granddaughters to whom she said more, gather to mourn. They gather on Kangaroo Island, Nell’s home – always. As Uncle Jim says, Kangaroo Island has always been a place for mourning. Pearl has returned to Kangaroo Island to bury her grandmother. It is the place of her happy childhood. For Diana, Nell’s daughter, it is a place she returns to reluctantly, a place that has always stifled her. She has come to bury a mother who always eluded her. 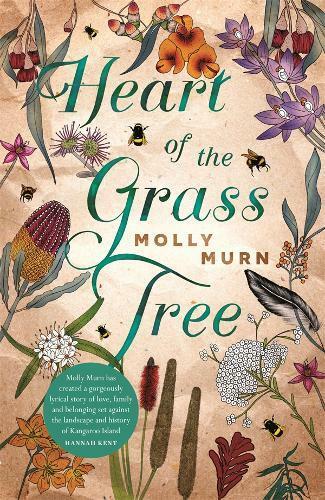 In her debut novel, Molly Murn reaches out to draw together the threads of a family with many secrets from one another and weave them into the history of settlement on Kangaroo Island. It is a history long elided. It is a history of brutal conquest, and a history of contested ownership. In the past other mothers and daughters have come to Kangaroo Island. Maringani comes to Kangaroo Island holding on to the arm of her mother, who had been kidnapped and brutalised by sealers. Later, Maringani chooses not to leave Kangaroo Island and her story is woven into the history of Indigenous women on the island, which is always visible if you look for it. Murn weaves these layers of mourning together: from the recent loss of Nell to all the secret ways in which Nell herself had mourned, and back to the original mourning of Kangaroo Island’s first permanent settlers. Heart of the Grass Tree is a story, richly told, of the landscape of Australian history – both emotional and physical – and the way we record these stories of place. Marie Matteson is from Readings Carlton.